Forty years ago, a Christian rock band was born: Petra. It's amazing to think about the ministry Petra has done over the course of those four decades. I hope in some small way that petrarocksmyworld.com contributed. From 1998 through 2006, this website was the premier Petra fan site. Those were the years of my early adulthood, and I covered Petra like it was a news beat. This was the place to get the latest news, tour dates and concert photos; the first place that had all the lyrics for Petra's albums; and the home of an active, interesting discussion board. It goes without saying that Petra means a lot to me. It was because of Petra that I met my wife, Yoli, a Petra fan who lived on the other side of the equator: in Bolivia. But in 2005, Petra retired (and the news broke here on this website). In a way, their timing was good, because my first daughter was born that summer. In short order, my family expanded from two to six, and I didn't really give this website much thought. But Petra was still doing things. There were occasional concerts. There was a two-year reunion of the 1980s incarnation of the band as "Classic Petra," which led to a couple new albums. And here were are in 2013. A 40th anniversary compilation has been released with a new song ("Holy Is Your Name"). Petra has announced plans to join the Classic Rock Tour in 2014. I can't promise to keep this website updated the way I did during its heyday. But I hope fans continue to support Petra and that Petra continues to rock the world. CITAS on DVD: It's a reality! You wanted Captured In Time And Space on DVD. You're going to get it. Bob Hartman initiated the project, paying EMI to license the video, and then personally overseeing the process of transferring the video from his personal pristine VHS copy. Hartman says the DVD will be available online exclusively through www.petramerchandise.com. The DVD will sell for $14.99 and will be available around June 5 when he returns from a trip overseas. 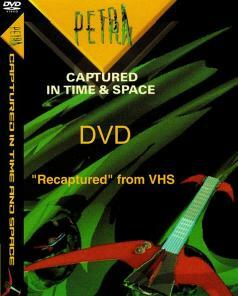 This will be the first and only licensed and authorized DVD of CITAS. For years fans have petitioned Hartman and EMI and others to re-release CITAS on DVD, but had no success until Hartman's announcement. One obstacle was the issue of the video's masters. "The CITAS masters were 'lost' by Starsong years ago," Hartmain explained in a message on the Petra Zone. "No one knows where they went." But persistent emails from fans spurred Hartman to find a way to make the DVD a reality. Hartman ended up licensing the video from EMI and then paid for artwork, mastering, and manufacturing. The investment is a risk, but if it pays off he says they would consider releasing other Petra videos on DVD. "We might only sell 50 copies," Hartman wrote on the Petra Zone. "We would then lose money and not do it again." The DVD will not have bonus features nor will it have the Beat the System concept video that is included with the cassette. "We didn't think we needed to license anything else until we see if this makes any sense (financially)," Hartman told petrarocksmyworld.com. "If it doesn't make sense financially, at least we got this out there to our fans and maybe put a halt to bootlegs on eBay." Get your taste of the "Petra: Farewell" DVD! Petra Rocks My World brings you an exclusive in-depth review of the DVD. Check out our review of the CD (the first published! ), three sound clips, and MUCH more! It's all available in our mini-site Petra Farewell HQ. Petra ended its 33-year ministry, but you can still check out our coverage of the farewell tour. "Petra Farewell" event review: I attended the recording of Petra's final album, along with hundreds of other fans. Read about the amazing experience. "Petra Farewell" event photos: Well, we took three rolls worth of photos. Very few turned out, unfortunately. But take a look at what we got! Farewell Tour dates: Check here to see when they're coming near your town. This is your LAST chance to see Petra live! As we reported in this article, Petra recorded their final live album on Oct. 4 in Franklin, TN. Greg X. Volz and John Lawry participated. Click here to get all the details from our initial news story. It was first reported on PRMW: Bob Hartman and John Schlitt both confirmed that Petra will retire after this year. To learn more, please see our coverage below. Exclusive interview with John Schlitt: "I had a total peace" about the decision to retire, he says. He talks about why they made the choice, his hopes for the farewell tour, and much more. Band's founder confirms Petra plans to retire: Read this story first. It explains why Petra is retiring and what lies ahead. It also takes an in-depth look at Petra's recent history. Petra testimonies: Around the world, people have been transformed through by Petra's ministry. I have added even more of their stories. Petra's official website: The band finally posted the promised press release on their petraband.com website. John Schlitt newsletter: This newsletter was posted on John's website in the days after the retirement story first came out. Share your story: I am compiling a collection of stories and testimonies about the way Petra's ministry has impacted people around the world. Post on the messageboard: Talk about the news with other Petra fans at "Petra Rocks The World."